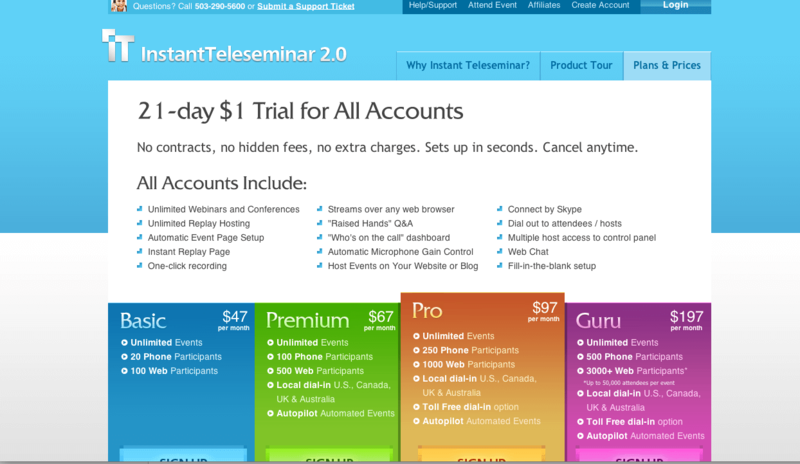 Instant Teleseminar is an online product for running webcasts, webinars, online conferences, telesummits, teleconferences; whatever name you prefer, Instant Teleseminar gets the job done for most people. I have provided Instant Teleseminar live event support to clients and review it below. Watch this 1 minute video tour. You can see from the pricing below, their cheapest package at $47 per month allows you to run an unlimited number of events with 100 web participants and 20 joining by phone. These days, there is usually a smaller percentage of people who choose to dial in, so you could easily get away with simply sharing the webcast link instead of allowing folk to join by phone. If you plan to hold big events, Instant Teleseminar allow up to 3000 web participants which is pretty cool considering that GoToWebinar have a cap of 1000 web participants. The handy thing is that they have a trial, so you can check it out for yourself. If you do decide that you want some additional support with your webcast, we can help you to practice and learn your way around the backend. We can also be there for you live on the day to help. No live screencast / screensharing. If you plan to run audio only events or work from a powerpoint presentation, Instant Teleseminar is fine. But if you want to do online live tutorials and share your screen in real time, this isn’t the product for you. Check out AnyMeeting instead. The navigation confused one of my customers. Now, I didn’t personally find the admin navigation confusing, but one of my clients found it difficult to remember where to find things on the admin dashboard. This made her nervous before the live event, so we needed to practice a bit to make sure she was comfortable. The Instant Teleseminar site may be ugly, but the good news is that they allow you to embed their player on your own website. I love this feature of Instant Teleseminar. It means that if you’re holding a free webcast or webinar, you can have a link to buy a product you are promoting right on the page. Even if you choose not to do that, being able to have the page on your domain with your branding is a major advantage. It doesn’t matter too much about their yucky media player, because you can download the recordings and add them to your website using a media player that you choose. I like that you can record a personal welcome. They have a live chat feature. You can also nominate a moderator to help manage the chat. Pre-record calls and play them back when you want. Please let me know what you think of Instant Teleseminar. Good experiences? Bad experiences? What’s your favourite product?